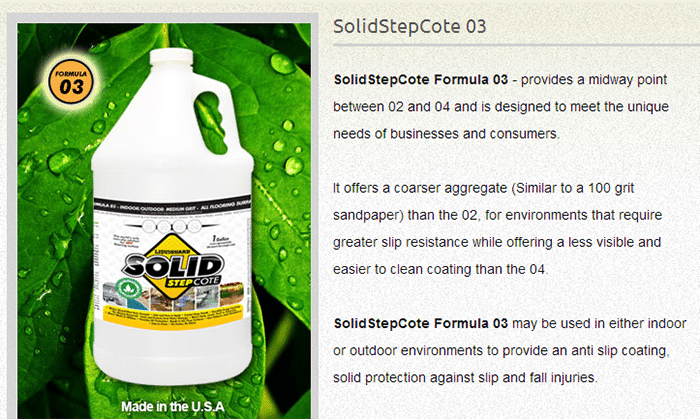 SolidStepCote crystal clear anti-slip floor solution creates a durable, invisible anti-skid finish. Eco-friendly with low VOC's, exceeds OSHA and ADA safety standards. Designed for ceramic tile, marble, stone, granite, concrete, and vinyl flooring. 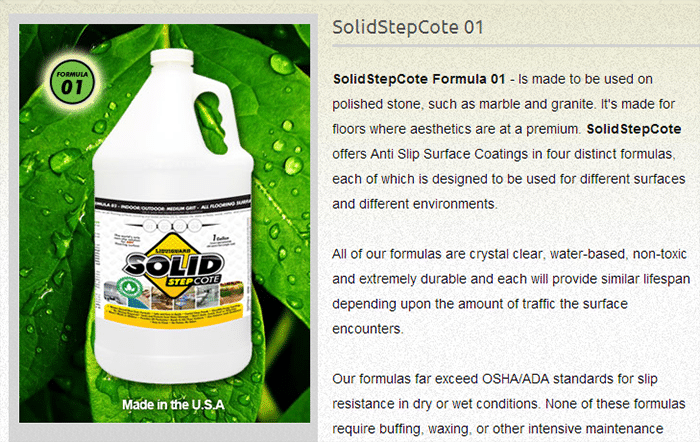 SolidStepCote crystal clear anti-slip floor solution creates a durable, invisible anti-skid finish. Eco-friendly with low VOC’s, and exceeds OSHA and ADA safety standards. 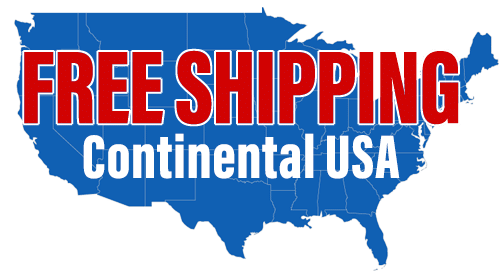 Designed for ceramic tile, marble, stone, granite, concrete, and vinyl floors. 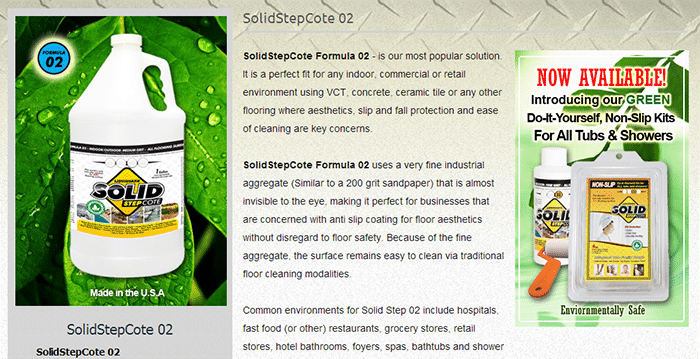 SolidStepCote is a eco friendly professional anti skid floor coating solution which is water based. 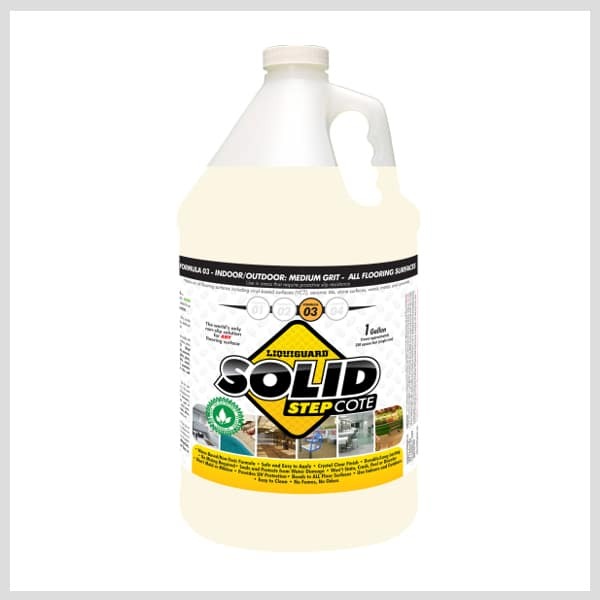 The product dries crystal clear and upon doing so it will generate a non-slip texture that’s very efficient for both outdoor and indoor flooring. What makes the product stand out is the fact that SolidStepCote is a easy to apply single solution and, as such, it won’t require mixing. It will not damage the natural appeal of the floor and will blend seamlessly with a variety of floor substrates. Aside from allowing you to save money on your insurance by helping prevent potential accidents, SolidStepCote is also waterproof. This means that it will protect the surface while being able to help you deal with any stains more efficiently. The way the product was desinged also allows you to keep the surface safe from contaminants, cleaning products and other compounds that might cause discoloration. Moreover, you also get complete protection against UV rays, not to mention that the product is made to work well against mildew or any type of mold that will appear! Our solution is suitable for institutional, commercial, and residential establishments. It allows everyone that’s concerned about slip and fall injury accidents to address them properly! With SolidStepCote you get superior durability over any other competitor’s product, with a lot less time saving floor maintenance required. SolidStepCote is also a product that is facility friendly with no odors or fumes and you can apply it easily via a simple paint roller, paint brush, or low pressure spray. Plus, the product has super low VOC’s and exceeds OSHA and ADA standards. Our product is designed with 4 texture options, similar texture to a 400 grit, 200 grit,100 grit, and 50 grit fine sandpaper. It also helps maintain the original surface appearance without affecting the floor quality in any way possible. 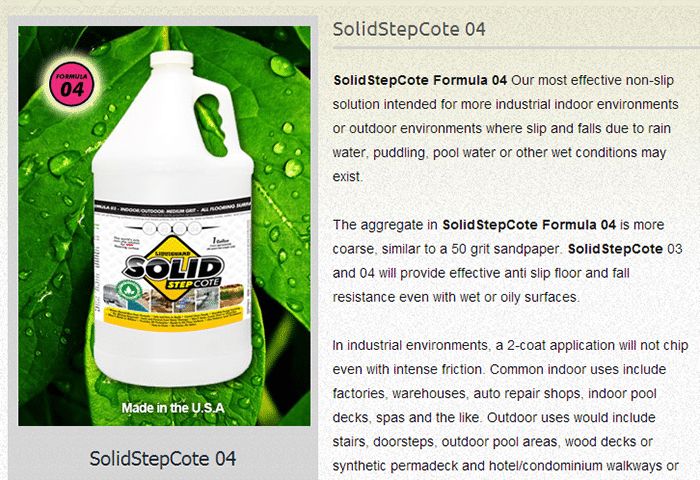 You can use a roller, brush, or low pressure airless spray to easily apply the SolidStepCote product. It’s important to shake or stir the product before you use it. You should also make sure that the surface you want to work on is dirt free. At the same time, remove any grease or oil. The coating will help you obtain a very attractive, glossy floor surface. Allow a full day or 24 hours for the coating to cure properly, avoid puddling or overlapping during application. When it comes to cleaning up, use water to wipe the splatters, spills and overruns. Combine warm water and soap in order to properly clean your hands and your tools.